As expected, Motorola has launched a new Motorola G budget phone for 2016. For the first time, a more premium option for the Moto G range. It’s called the Moto G & Moto G4 Plus. It comes better features than Motorola G4. The phone seems a perfect device which can last long & deliver stunning performance. We have already seen Motorola’s build quality which is simply great. Most of us prefer Android device because of it’s great level of customisation & never ending way to amaze you with its feature. But in term of customisation and optimization options, Stock ROM doesn’t have too many possibilities. Most of us prefer to go beyond the Stock features & gain main access to your device i.e Super user access. 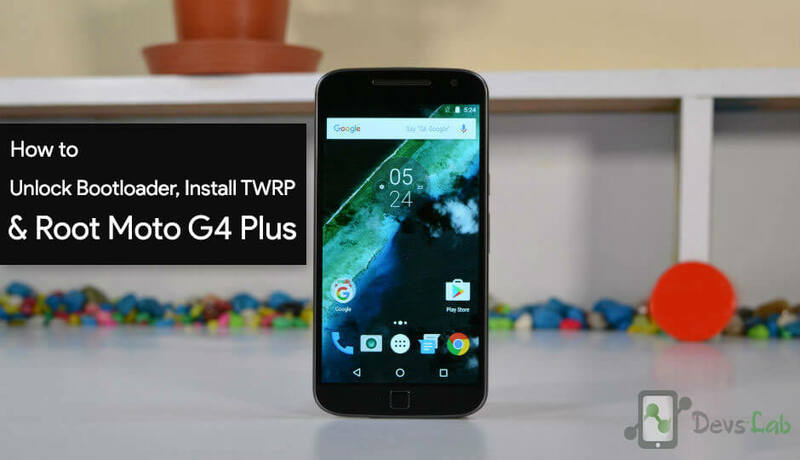 Today we’ll guide you step by step How to Unlock Bootloader of Motorola G4 Plus, Installing TWRP in G4 Plus & Rooting Motorola G4 Plus. Rooting your device is not only for performance but to get tones of new features. 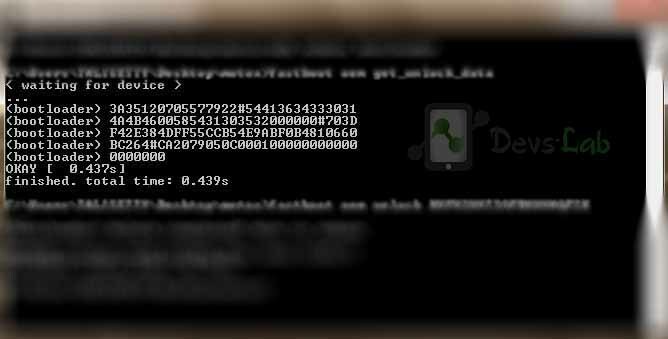 You can find some of the features of rooting your device. Follow the Procedure to setup & install Minimal ADB files. – Minimal ADB Tool & Setup. Stage 1. Unlocking Bootloader of Motorola Moto G4 Plus: In this step, we’ll unlock bootloader which will allow us to install custom softwares & TWRP recovery. Stage 2. Installing TWRP Recovery in Motorola Moto G4 Plus: In this step, we’ll install a custom recovery named as “TWRP”. It allows flashing custom zip files. We can install TWRP recovery only if bootloader is unlocked. Stage 3. Gaining Root Access in Moto G4 Plus: In this step, we’ll flash SuperSU.zip from TWRP recovery. SuperSU hooks into your system files & acts as bridge between system files & other Apps which require Root access. Step 1. Enable USB debugging mode in your Motorola Moto G4 Plus, Goto Settings > About Phone > Tap on build Number 7 times. Now go back to Settings, you’ll find a new option as ‘Developer options’. In Developer options, enable USB Debugging mode. Step 2. Follow the Minimal ADB Tool setup guide. Connect your device to PC using a USB cable. Launch the ADB.exe file which will open up as a command window. Step 6. Now, Goto Motorola’s Boot loader unlock site & login with Google. Paste the entire code in the input box which says, Check if your device can be unlocked by pasting the string by pasting the string in the field below & clicking can my device be unlocked. Step 7. After pasting click on “Can my device be unlocked.” After that, you’ll see a request unlock key option at the bottom of the page. Check I agree and click Request Unlock Key. You’ll receive the unlock key in your Gmail. 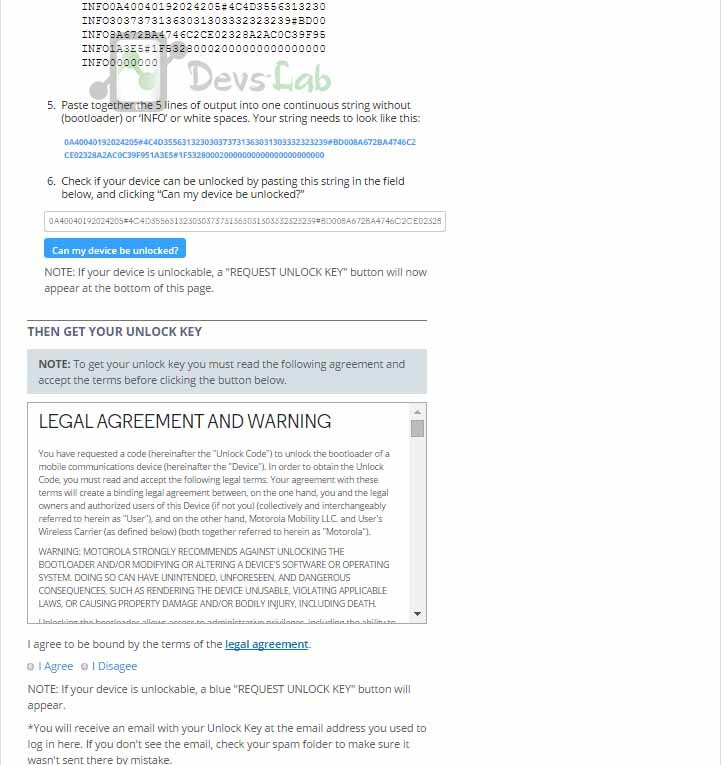 It will unlock your device. Congratulation you have successfully unlocked your device. Step 2. Boot your device into fastboot mode (Switch off your device. Press & hold, Volume down button and power button). Step 3. 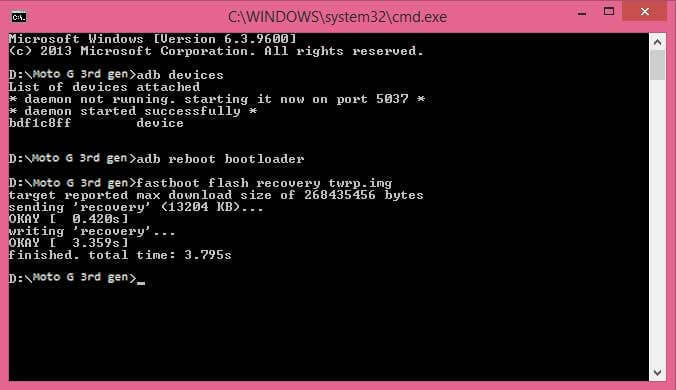 Open adb.exe file & type “fastboot flash recovery twrp.img” (If the file name is something different like twr232.img, just replace twrp.img with twr232.img in the command). This will flash the TWRP recovery in your device. Step 1. We are going to use the Systemless Root procedure. Step 2. Make sure you boot or install TWRP. Boot into it. Now as you have rooted your device, you can checkout our list of Top 10 Apps for Rooted Smartpones. You can also install Xposed Framework & change System files without installing Custom ROMs. Soon we’ll update new Custom ROMs for Motorola G4 Plus as soon as their are out. If you are stuck at any point, you can comment your query below.